By Sean Jones: Tom Loeffler says middleweight champion Gennady Golovkin wants an even 50-50 split for the rematch with Saul Canelo Alvarez, as he feels that as the champion, he deserves equal money after previously getting the smaller 70-30 split for the first fight last year in September 2017. According to Loeffler, Canelo made $50 million for the first fight compared to GGG’s $20 million. Despite being given a larger percentage offer for the rematch, Golovkin could end up with less money than the first fight due to Canelo having tested positive twice for clenbuterol, and the controversy involving the 12 round draw from their fight last September. On social media, a lot of boxing fans are saying they have no intention of purchasing the Canelo-GGG II rematch because of Canelo’s positive drug tests and because they feel that Golovkin won’t get the decision due to the judging. In other words, a lot of fans feel that the fight is now tainted now. If those fans choose not to pay to see the second Canelo vs. Golovkin fight, then GGG could wind up making less money than the first fight even though he’s being given a larger percentage than last time. “All Gennady came back with is that, ‘I just want a fair split, I want a 50-50 split. I’m the champion,’” Loeffler said to the Press Telegram. Canelo will make less money as well obviously, but he’s still getting the lion’s share of the revenue and he already made a bundle from the first fight. Golovkin is more negatively impacted than Canelo because his percentage is far less than his. If the fight is now tainted in the eyes of a lot of boxing fans because of Canelo’s positive drug tests and the controversial draw, it doesn’t work in GGG’s favor to agree to the 65-35 purse split. Golden Boy wants 65-35 split for the rematch, which would again give Canelo the far bigger purse even though Golovkin is the world champion. GGG would receive a purse of $24.5 million and Canelo $45.5 million if the fight generated $70 million like the first fight did last September. Canelo would still receive the lion’s share of the money as the challenger. Golovkin would get a $4.5 million increase from the first fight, but he’d likely lose his International Boxing Federation middleweight title by taking the fight with Canelo in September. Normally, the champions better the larger purse than the challengers, and it’s unheard of for a 3-belt unified champion to receive far less money than their challenger. Golovkin feels it’s not fair for him as a champion to be making less than his challenger Canelo. Golden Boy Promotions president Eric Gomez is deeply upset, and says the fight is off. Gomez says he spent a month and a half on negotiations for the rematch, and then he finds out that Golovkin (38-0-1, 34 KOs) wants parity with Canelo Alvarez (49-1-2, 34 KOs). Gomez thinks that Golovkin intentionally wants out of the fight with Canelo because he’s afraid, which is the same thing that Golden Boy CEO Oscar De La Hoya has been saying. 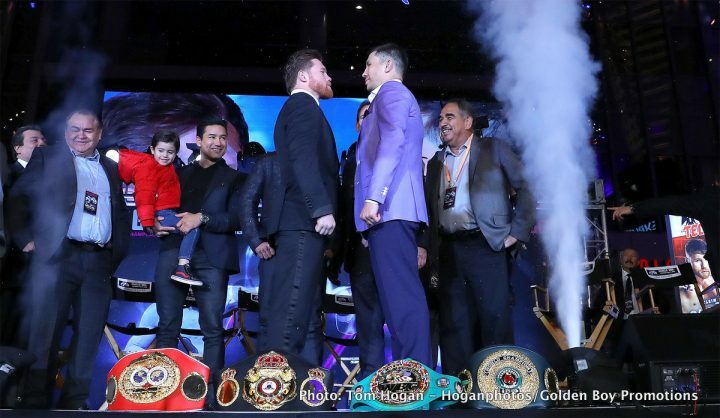 In the previously scheduled Canelo-Golovkin II rematch on May 5, the two sides had agreed to a 65-35 split with Canelo receiving the larger split of the money. This deal was only slightly better than the 70-30 purse split for the first fight. After GGG proved himself in the first fight in terms of bringing in a lot of pay-per-view buys on HBO pay-per-view, he wants a better split for the rematch. Golovkin has given Loeffler his instructions for the purse that he wants from Canelo. It’s unknown what percentage split Loeffler thinks Golovkin should ask for but it’s possible that he would agree to the lesser purse of 65-35 that was offered by Golden Boy for the canceled May 5 rematch. It’s still not too late to save the fight, but there will need to be some give on both sides to make the fight doable. From Golovkin’s standpoint, his request of a 50-50 equal purse split sounds reasonable after everything he’s gone through with the questionable 12 round draw from the Canelo fight last September, and then the Mexican star testing positive for clenbuterol twice last February and pulling out of the May 5 rematch on short notice. Golovkin stated not long ago that he suspected that Canelo was using a performance enhancing drug for their first fight. Canelo didn’t fail any of the drug tests for the first fight, but GGG has his suspicions. “We made a lot of concessions for the rematch after Gennady proved his value. But Canelo, for whatever reason, was insisting on still having a huge advantage. … It was 65-35 percent for the rematch and Gennady thinks that’s just not fair. Taking 35 percent as the champion is just not fair,” Loeffler said. It’s very difficult to imagine Canelo and Golden Boy Promotions ever agreeing to give Golovkin a 50-50 split while their fighter’s career is still on the tracks. That might not be much longer though. If Canelo chooses to face Gary ‘Spike’ O’Sullivan on September 15 instead of one of GGG or one of the elite middleweights in the division, it’s likely going to hurt his popularity even more than it already has been from his failed tests for clenbuterol and from the perception that boxing fans have that he was given a gift draw by the Las Vegas judges last September for the GGG fight. Canelo is in a bind. If he faces Spike O’Sullivan, he likely hurts his career. If Canelo fights Jermall Charlo, Daniel Jacobs or Billy Joe Saunders, three names that De La Hoya mentioned as possible options for his September 15 fight, then there’s a good chance that he loses. A loss for Canelo would likely hurt his earning power enough to where he could no command the lion’s share of the purse for a rematch with Golovkin. In that case, Canelo would be fortunate to get even a 50-50 purse split for the GGG rematch. Gomez thinks that Golovkin wants out of the fight, and by asking for a 50-50 split, he’s trying to get out of it. Loeffler thinks it’s nonsense that Golovkin is trying to get out of the fight. Golovkin is not afraid of Canelo, he points out. He just wants a higher percentage of the revenue than the first fight, and he fees that as a champion, he should at the very least rate a 50-50 split. Golovkin and Canelo fought to a controversial 12 round draw on September 16 last year at the T-Mobile Arena in Las Vegas, Nevada. The judges’ scores were 115-113 for Golovkin, 118-110 for Canelo and 114-114. It was the oddity of the 118-110 and 114-114 scores that had the boxing pubic in an uproar. The 118-110 score from judge Adelaide Byrd comes out to Canelo winning the fight by 10 rounds to 2, which was an embarrassingly bad score because Golovkin was the one that the fans felt won the fight. The judge that scored it 114-114 gave Canelo round 7, which is agreed by many as Golovkin’s strongest round in the fight. Canelo was battered in the 7th, but for some reason the judge him that round. The other two judges had Golovkin winning the 7th. If the judge that scored it 114-114 had given Golovkin the 7th, he would have won the fight by a 12 round split decision.